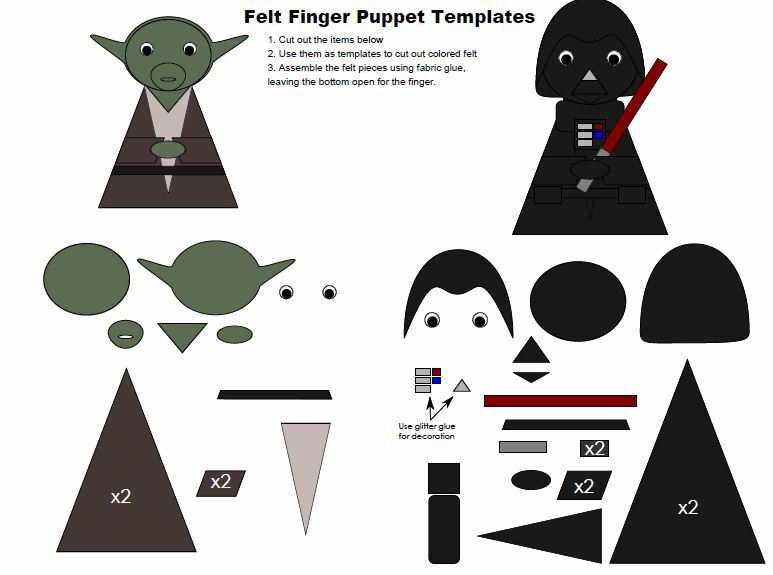 We saw these Star Wars felt finger puppets a few weeks back, though they were posted to Make and Takes website a few years ago. Simple felt finger puppets using basic shapes and easy to put together. Of course, once we sat down to start working on them, I wanted to come up with a faster/more efficient way of cutting out the felt pieces. That got me hand drawing which rapidly turned into an Inkscape project because I knew I could reuse elements. It spiraled out of control. 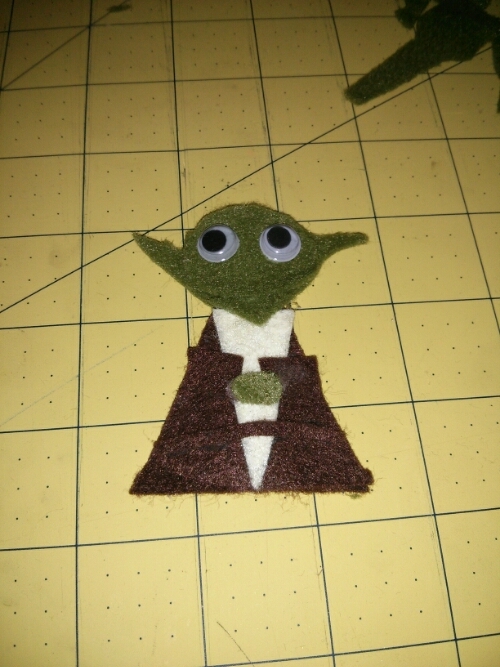 Once I had gotten all the felt templates done, I realized just how far I had gone and knew it would take us a while to get the puppets made, but the troops were getting restless. 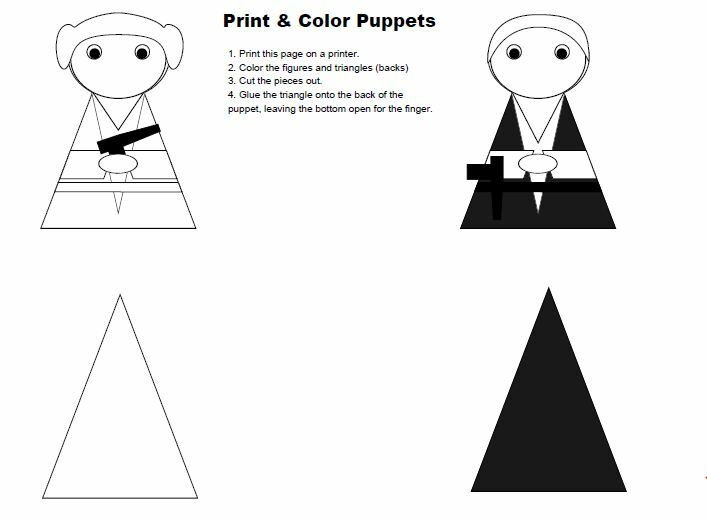 So, I took the templates and turned them into printable/colorable pages that could be used to make finger puppets out of paper. Huge hit and it gave us time to get the felt ones in work. 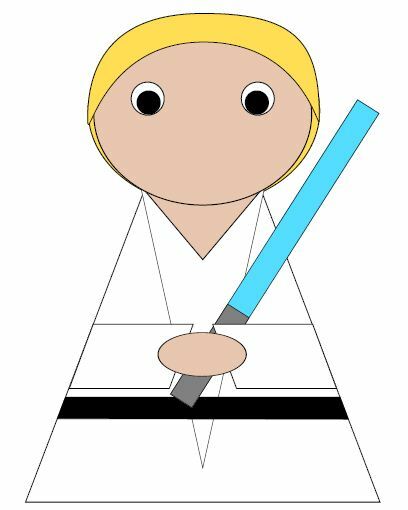 So, all the templates have been compiled into a downloadable PDF – felt template, a color printable, and a black-and-white printable for coloring. 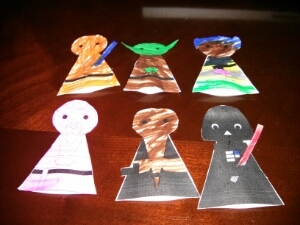 Included in Volume 1 are Luke Skywalker, Obi-wan Kenobi, Princess Leia, Han Solo, Darth Vader, and Yoda. More will be coming soon as I’ve already been asked for Darth Maul and R2D2 and C3PO. This post is about my current writing process and the work that my process is both forming and informing. The idea is courtesy of M. A. Chiappetta. She and the ladies at Purple Ink Writers started this blog-hop with the intention of getting some discussion going about the writing process and the things that we writers are working on right now. I want to thank Michele and company for tagging me as part of the hop and hope that it can provide some insight and exposure for me as I continue my work. Day 1 is done and so far I’m on pace for my goal of 22000 for the month. But it is pricing harder than I thought it would. It just goes to show that just because you’ve done something once doesn’t make you an expert. The advantage I have now over last November is that mentally I know I can do it. I find it very similar to running. I may not run a 5k very fast but I know I can finish one. The mental aspect of the challenge is gone. So even though I haven’t yet gotten my words in today, I’ll get them in before bed. After seeing the immaculate blog layout of one of my new reader/writer acquaintances, I realized that my blog wasn’t really optimized for people to navigate, especially their first time accessing the site. So, I have moved to a new theme that allows a better static starting page and have made the menu easier to navigate while reading the book. The menu now has a section for all of my writings (as I plan on adding more of my work here, both for critiquing and for reading) and the pages for the novels will have the chapters listed for clearer navigation and finding the next chapter. I hope the changes improve the site and make it easier to find your way around. Welcome and thank you for your interest in providing me with critiques from Critters.org. The chapter posts are password protected to prevent “first publication” disputes and to limit access to the manuscript. To obtain the password, please fill out the form below and I will email you the password. Please use the same email that you have registered for Critters.org so that I can award points after you have finished critiquing. NOTE: I will never use your email for anything other than communicating about your critiques or my novel. Please also read the Welcome and Ground Rules to review the type of critique I am after. Critiques should be left as comments appended to the chapter posts. Here is the link to Chapter 1 so you don’t have to hunt through the archives. NaNoWriMo is DONE! And so am I! The month of November is nearly over. Out there in the world, 300,000 people rush to finish. But I am not one of them. Because I finished last night! National Novel Writing Month (NaNoWriMo) will officially end at midnight tonight, but amazingly, at 50,703 words, I validated my novel last night at 11:30pm. That’s new words – the book is about double that, but I wanted validation of my efforts this month. I honestly cannot believe that I did it. Eyes feel slightly crossed and everything has a muzzy sensation, mostly I think due to the hours spent in front of a screen and the lack of sleep. But it’s done! What does that mean for you, my fair alpha readers? It means that my basic, very, VERY rough draft is done. It also means that now, instead of working on new words, I can focus on revising and posting what I’ve done. And THAT means chapters will be coming fast and furious. My goal is to have revised and posted all chapters, the whole book, by Christmas Eve. I’m calling it Alpha December; 25 days of non-stop revising and posting for your holiday reading pleasure. Based on the fact that Chap. 11 is already up, that should translate into a chapter every two days to meet my deadline. Sleep deprived? I can manage another month. If you haven’t yet had a chance to start reading, I still very much look forward to your feedback and hope you will have time to read. If you have started, but haven’t taken time to comment, please do so. Even an “I liked it” is helpful if you don’t know what else to say. For those who have been steadily slogging along, reading and commenting as I post, I thank you. I hope you are enjoying it. And I hope I make your holidays a little more fun with a new story. Thank you for your patience. And to any others out there who have had a story percolating in the back of their minds, I challenge you to start. Get it down on paper or screen. Camp NaNoWriMo starts in August and again in September, so you’ve got some time to prep your story if you want to go for something official. But start. It’s worth it.